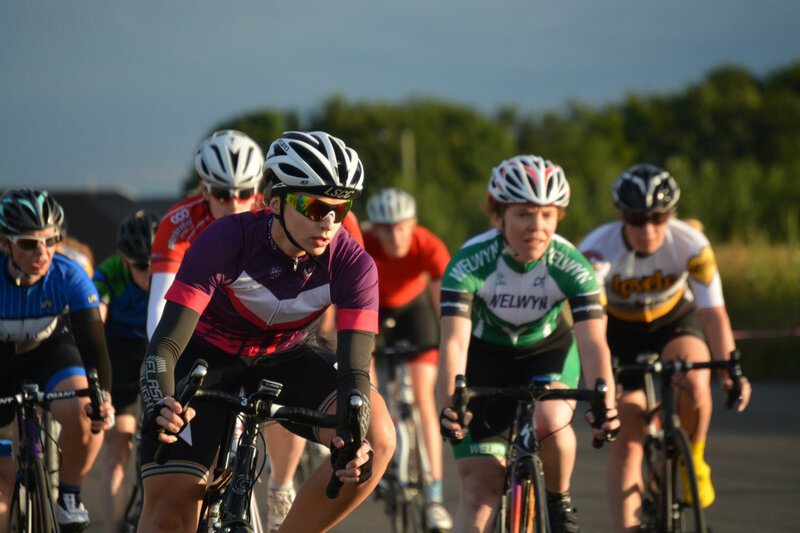 Our first interview of 2017 is with Harriette who rode her first racing season in 2016. 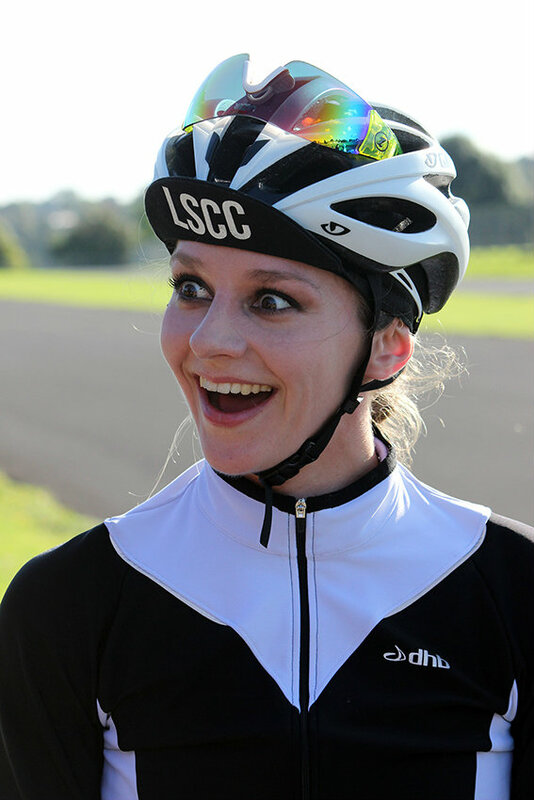 Having progressed quickly to get some good results leading to confirming a cat 2 license she speaks with us about her season, top tips for any new racers as well as her plans for the future. How long have you been cycling for and what was it that got you started? I first took up cycling on my placement year, where as an intern, I was earning £100 a week. As this had to cover rent, bills and food, it unfortunately meant that I could not also afford the bus at £6.50 a day. As a result, at the age of 21, I took up cycling to commute the 30km a day on my heavy hybrid, which I’d had since I was 14. I have always been competitive and it was on my discovery of Strava that I began to develop the cycling bug, as each ride turned into a race and I’d try to chase people down! I then went back to Loughborough University for the final year of my degree, where due to the work load, I didn’t have much time for sleep, let alone cycling; it was only when it was effectively taken away from me that I came to realise just how much I loved it! 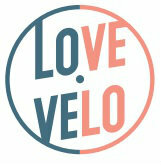 What is it you love about cycling? My love for cycling extends beyond the obvious competitive side of racing and the associated health benefits of the sport; cycling is my freedom. It can be anything from a pleasant afternoon pootle, or a social event where you meet new people and see beautiful places, right through to something where you can give your all ,blasting up a hill or the adrenaline hit from smashing it out in a race. In addition, I have found cycling to be an amazing stress buster, it gives you time and space to clear your head and escape the stresses of daily life. As it is a non impact sport, it is great for people who suffer with injury and can be done at any age. In addition to all these positives, at the same time, you are getting fitter whilst most importantly having fun! You started racing last year, how did that go? I only started training properly on a regular basis in May 2016 before starting to compete. I had my first ever race in mid July 2016, where I went from Cat 4 to Cat 2 in 2 months. So the experience for me was very exciting and surprisingly successful! I absolutely loved it, as in addition to the psychological boost from doing well, I met so many different people with a similar interest, whilst seeing parts of the country I may not otherwise have visited. When I started racing, I was going through a very tough time emotionally and the focus of racing and training was without a doubt what pulled me through it. Before I took up racing I was apprehensive that I wouldn’t do well. As most races seemed to be every category from Elite to Cat 4, I thought I simply wouldn’t stand a chance! Up to that point I had only ever cycled on my own, or occasionally with some of the boys from Loughborough (where I went to University), who were comparatively much better than I was. What’s your motivation when training and competing? My motivation with training and competing is simply to be the best I can be. I find a lot of motivation and satisfaction from seeing my improvements, no matter how small they are, as every step forward is a step in the right direction. As tough as training can be, especially when I’m tired and the weather is bad, I always feel that I have achieved something in that day by dragging myself onto the bike and giving it a go; in those instances, I often come off feeling great and pleasantly surprised as a result due to how unexpectedly well the session has gone. Have you any tips for anyone wanting to take up racing? My tips for anyone looking to take up racing would be to just go for it; you never know, you could be better than you think and end up winning!! If you haven’t had much bunch riding experience, I would say it was essential to go and tag along with a local club to get used to riding safely in close proximity. 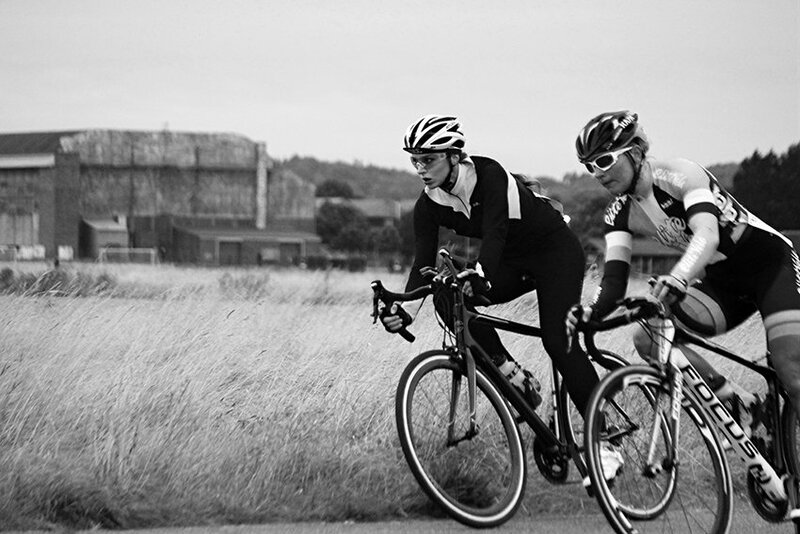 Club rides and chain-gang practises are the way to go. 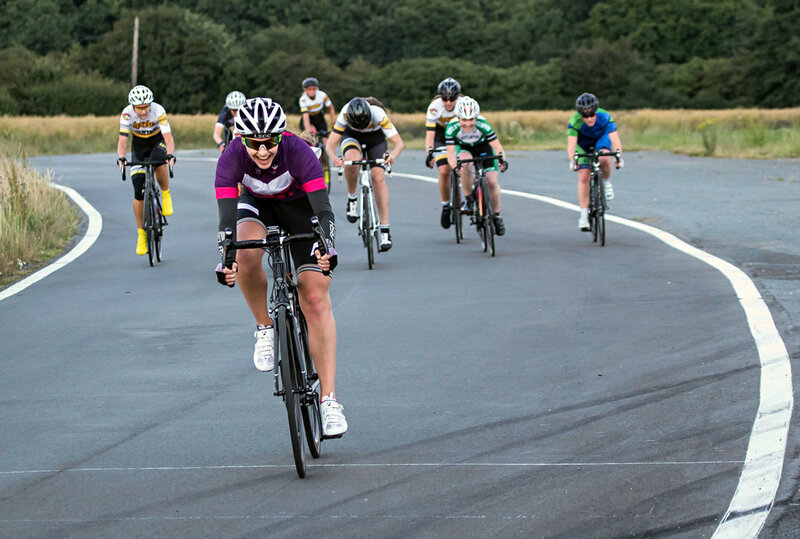 Before I started racing, I also attended one of the Surrey league “race preparation sessions” which not only gave me some tactical advice but also improved skills such as fast cornering, so when I came to my first race, it was more of a known entity. Finally, when coming to choose your first race, if it’s possible, aim for a race that is for category 2/3/4 or category 3/4 only, simply so your first experience isn’t potentially against “the pros”, which may be a little daunting. If you can, check out the weather forecast and the course terrain, so if possible you can have a recce before the race. If you’re anxious or have any questions, contact the race organiser, as they’re usually really helpful and eager to help. What’s your biggest cycling achievement? My biggest cycling achievement has to be my progression to Cat 2 in such a short space of time; I had not thought it’d be possible to get so far so quickly. So with British cycling there are 5 categories of race licence: Elite (think famous pro cyclists), category 1, 2, 3 and 4. Everyone starts at cat 4. To move up the ranks you have to gain points (a bit like a league). You gain points by doing well in races (e.g. 10 points for a win, 1 for 10th place). Most women’s races are graded E/1/2/3/4 or 2/3/4, so to move up, I’ve had to do well/ beat women who are ranked higher/ who are much more experienced than me. For men, as there tends to be more entrants (there are more male than female cyclists in general), you’re often racing against your own category (E.g. cat 4 only race or cat 3/4 race). From most people I’ve met, it usually takes a couple of seasons to go from cat 4 to cat 2. So basically I’ve gained a lot of points in a pretty short space of time/ done a lot better than I had expected possible and hence I am extremely happy. What’s your biggest strength on the bike and what would you like to improve on? I am still working out what all my strengths are, as in relative terms I am still very new to the game. However, I would say my biggest known strength would have to be the sprint for the line at the end of the race. 😉 Like everything in life, there is always more to learn and so much to improve on. I know I am very naïve in the world of cycling, marginal gains and to a degree bike maintenance, so those are always very useful areas to improve on. In addition, I would like to expand my experiences and try out different kinds of cycling and racing, such as time trialling. 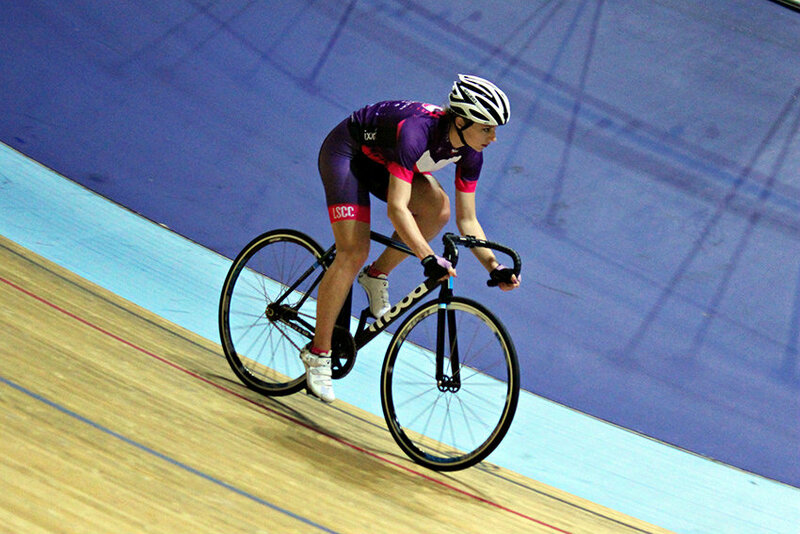 In October 2016, I moved up to Manchester to live closer to a velodrome, where I could take cycling more seriously and get on the track more. 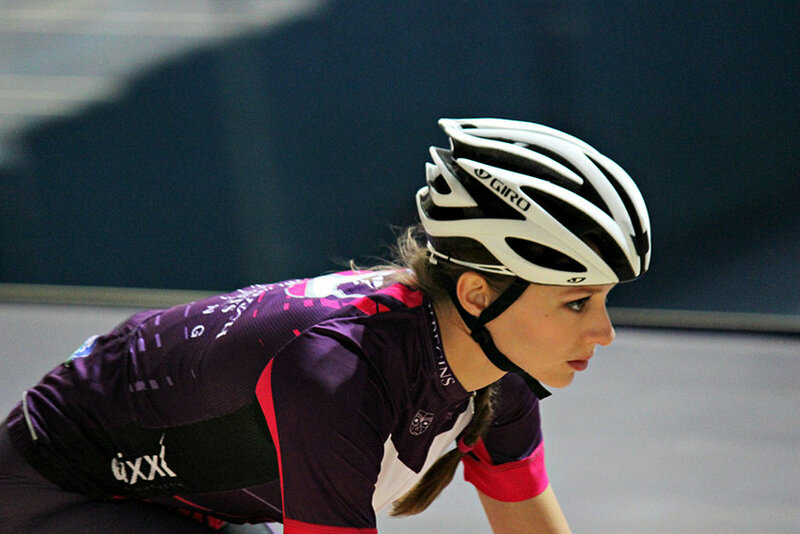 My biggest goal would have been the National Track Championships at the end of January 2017. However, at the beginning of November 2016, I dislocated my shoulder in a freak accident, which in terms of my cycling plans was a big set-back. It will take 6 months to a year to heal. However, I’m keeping up the fitness in the gym and on the turbo, so when I’m able to ride a bike again, I’ll hopefully come back stronger! The agenda is to get back on the velodrome and get my confidence back when I’m able to ride again, and to take up some of the individual competitive events until my shoulder is stable enough to get back into bunch racing.